By far the biggest boon of white gas is that a white gas stove burns efficiently in very cold temperatures, while most butane-propane stoves burn very slowly in cold air (if the butane-propane gas is cold it exerts reduced pressure on the walls of the canister and thus escapes out the valve more slowly. Remember, PV=nRT…). In addition to burning well in cold temperatures, white gas is inexpensive compared to butane-propane canisters, and on extended expeditions a large volume of liquid is less of a burden than a mountain of metal gas canisters. Despite it’s advantages, white gas stoves have limited usefulness on a route. They are typically much heavier than butane-propane stoves, the priming required to light them makes them potentially hazardous to use in a bivy tent, and they are not available in with decent hanging systems. A good plan for extended trips to places such as the central Alaska Range is to bring a white gas stove for basecamp and a butane-propane canister stove for the route. 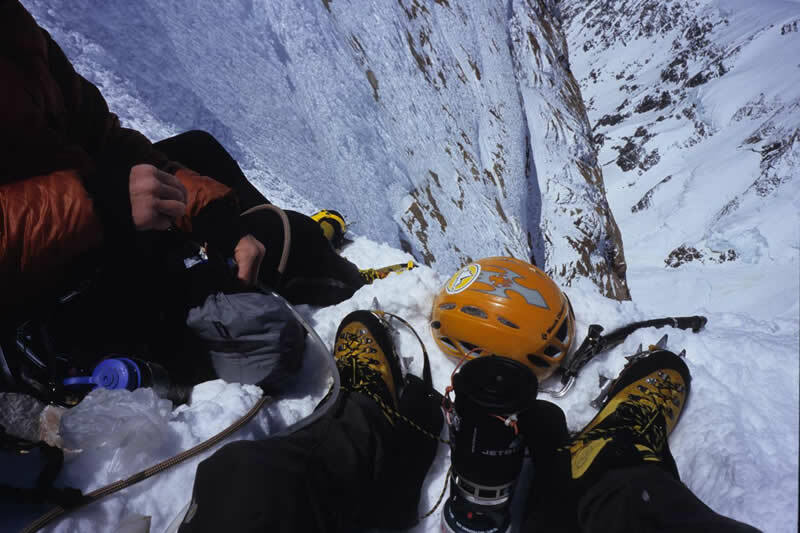 Using a Jetboil stove to brew up on a small ledge during a new linkup on Cerro Torre. Photo by Colin Haley. The Jetboil stove introduced the long-overdue innovation of a stove and pot that were joined together. This configuration is very fuel efficient because less heat is lost to the surrounding air, and also has dramatically changed the situations in which it is possible to use a stove. The Jetboil can be used while held in your hand, and many climbers have even melted water holding the stove partially inside their sleeping bag or jacket to block the wind. This same quality allows the Jetboil to be very easily converted to a hanging setup with the addition of only a small piece of cord. As a hanging stove, the Jetboil can be clipped to the roof of a bivy tent or even a hanging belay. Although canister stoves burn slowly out in cold air, they perform quite well inside of a tent because they will warm the air around them, which will in turn warm the canister. On some models of canister stoves that use a hose to connect the canister to the burner (such as the MSR WindPro), the canister can be turned upside-down to increase the stove’s efficiency in cold conditions. Although not yet available, the new MSR Reactor stove seems likely to become the standard for use in cold-weather alpinism. Undoubtedly inspired by the Jetboil, the Reactor has an integrated stove and pot, but in addition is advertised to burn efficiently in cold temperatures because of a new style of valve. If the Reactor’s performance in cold conditions proves to be as impressive as reports have stated it will be the ultimate alpine climbing stove: all the advantages of canister stoves, the advantages of the Jetboil, and efficiency in cold conditions similar to white gas. The best cooking pots are always made of aluminum. Steel pots are far too heavy, and titanium does not conduct heat well (and is only marginally lighter than aluminum). If not using a Jetboil-type stove-pot-combo, use the lightest aluminum pot you can find around 1.5 to 2.0 L capacity. Unfortunately, due to concerns of Alzheimer’s Disease, most modern aluminum cooking pots are made with a coating that adds substantial weight. The best place to find good cooking pots is often Goodwill or other thrift-stores, where you can still find old, cheapo, aluminum camping pots.